The trend is now impossible to ignore. Most of those words could easily have been written about “Cabin in the Woods,” a new meta-horror movie from fanboys-turned-filmmakers Joss Whedon and Drew Goddard. Writing about “Snow White” and “Mirror, Mirror” two weeks ago, I hypothesized that these movies about teenagers sent into the wilderness to die for the greater good of society reflect a deep animosity from the generation that is lurching towards an adult world already ruined by their parents. In “The Hunger Games,” the filmmakers and author Suzanne Collins portray its central character Katniss as an ordinary girl thrust into this dark wilderness – but she is also the leader of a revolt. 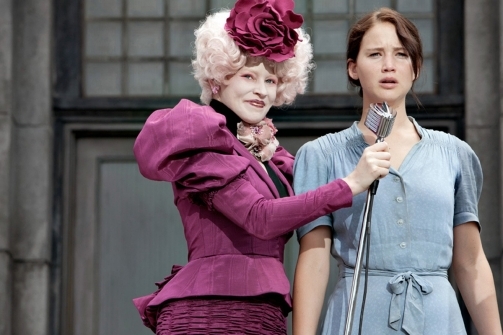 “The Hunger Games” trilogy is ultimately a tale of redemption that shows that the culture it is criticizing – of war, reality television, and ESPN – can be overcome. “Cabin in the Woods” forsees a far darker future. It’s impossible to write about this without spoilers, so if you want to be surprised, take this as your cue to leave (but not before bookmarking this page). We follow five archetypical teenagers into the woods for a weekend of partying at a cabin. Almost immediately, they are attacked by gruesome redneck zombies and get picked off one by one. Here is where the film takes its post-modernist twist. The zombies are not freak occurrences – we learn that the entire scenario is being orchestrated by a government entity whose massive office lies directly below the cabin. The filmmakers have fun presenting standard horror movie conventions and then turning them on their ears, but the irony hides a far more serious comment. We receive a series of hints as to why the government is going to all of this trouble to kill five teenagers in such elaborate fashion, but, absent of real thrills, the question that provides the film’s dramatic tension is this: are their deaths actually necessary or not? Are the technicians played by Richard Jenkins and Bradley Whitford doing an unpleasant but important public service or are they themselves being manipulated into carrying out these atrocities for other, more nefarious reasons? “Cabin in the Woods” would have been a far better film if it had been the latter, but in the final scenes, we learn the whole, unfortunate truth: the ancient gods that lie dormant beneath the earth’s surface require a sacrifice of five teenagers a year, without which they would rise up and destroy the earth. Which is exactly what happens, and it’s a terrible let down. With this choice, the filmmakers resolve the central metaphor of the film in the most depressing way possible. If teenagers are, as has been suggested in all three recent films, being objectified through war, reality television, and sports, then that objectification is a kind of death of individuality and truth. Again, “Cabin in the Woods” asks the question: is their death necessary? With the final scene that shows the ancient gods destroying the earth, they give their answer. Their sacrifice was not a scheme to please some rich and powerful people, like in “The Hunger Games.” “Cabin in the Woods” boldly states that the exploitation and eventual death of the next generation is necessary, but only because the world they inhabit can no longer be redeemed.